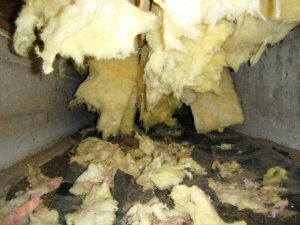 Insulation provides rodents and other critters with a perfect place to nest, especially during the cold winter months. If rodents and other animals are able to gain access to your crawlspace or attic, they can cause extensive damage to the insulation by tearing it apart and soaking it with their urine, feces, and fur. Damaged insulation should be replaced for several reasons. Not only can rodent debris and waste result in a pungent odor, it can also produce disease-causing toxins and attract other pests such as varied carpet beetles. Replacing damaged insulation will reduce the risk of pest infestations while providing you with cleaner, healthier air. Replacing damaged insulation is also energy and cost efficient. 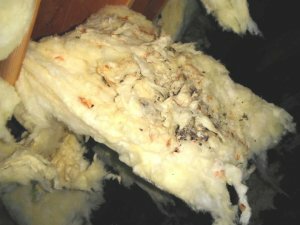 Torn and fallen insulation cannot properly insulate your home, thus escalating the cost of utility bills while trying to keep your home cool during the summer and warm during the winter. In addition to removing damaged insulation, we will also perform a thorough inspection to find out how rodents or other critters gained access to your crawlspace. We highly recommend exclusion to repair any entry points found, so once the insulation is replaced, damage doesn’t occur again. One of the most important features of a crawlspace is a proper vapor barrier. Vapor barriers, made of heavy plastic, cover the entire floor of the crawlspace. Its purpose is to help control moisture levels within the crawlspace and keep it dry, therefore deterring moisture issues such as mold and mildew. If the vapor barrier in your crawlspace is either lacking or damaged – we can help! We will remove your old vapor barrier and custom-fit and secure a new one. Our crawlspace clean-out service also includes the removal of cellulose debris and rodent feces. Removing damaged insulation and cleaning-out crawlspaces is a dirty and hazardous job – leave it to the professionals! We provide free inspections and competitive rates. At Surety Pest Control, customer satisfaction is our number one goal, so give us a call today! For Oak Harbor call (360) 675-3235, for Bellingham call (360) 734-2670, or visit our Contact Us page for more local numbers.